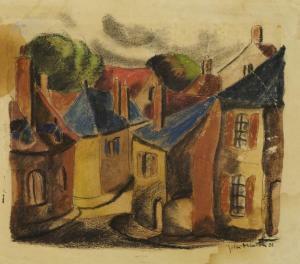 Find artworks, auction results, sale prices and pictures of John Minton at auctions worldwide. 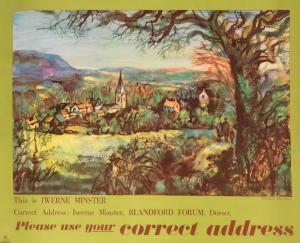 JOHN MINTON (1917 - 1957): "IWERNE MINSTER" ADVERTISING POSTER, offset colour lithograph publ. G.P.O, 90.5cm x 72.5cm, framed and glazed, with original cardboard tube Condition Report: Item appears to be in good overall condition, few crease marks but no visible tears. Recently framed and glazed by owner and was taken out of tube first time this year since originally posted in 1957. § John Minton (British, 1917-1957) The Portuguese Town, Mazagan signed and dated 'John Minton 1953' (upper right) pen and ink with coloured crayon and wash 27 x 37cm (11 x 14in) Provenance: Whitworth Art Gallery, Manchester, 'Pictures For Schools', 1957 Exhibited: London, The Lefevre Gallery, 'New Paintings By John Minton', December 1953, cat.no.17 Other Notes: John Minton visited Morocco in 1952 with Norman Bowler, and the following year, Minton exhibited a group of watercolours of Moroccan subjects at the Lefevre Gallery. 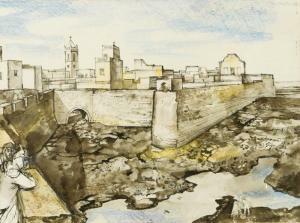 Another painting executed on this trip, 'Portuguese Cannon, Mazagan, Morocco' (1953), was presented to the Tate in 1957. 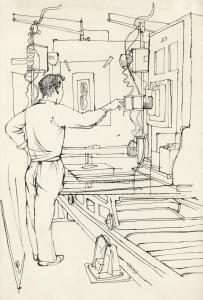 A pen and pencil drawing of the same subject which was also exhibited at the Lefevre Gallery in 1953 (cat.no.12), was sold at Christie's, London, 28 November 2000, lot 97 for £3,055 (including BP). We are grateful to Frances Spalding for her kind assistance with this catalogue entry. John Minton (British, 1917-1957) Still Life of Anemones oil on board 50.5 x 40.5cm (19 7/8 x 15 15/16in). (unframed) Footnotes Provenance The Artist's mother, by whom gifted to the mother of the previous owner, circa 1936, when they were neighbours in Manor Road, Wallington, Surrey Their sale; Christie's, South Kensington, 3 June 1993, lot 115, where acquired by the present owner Private Collection, U.K.
John Minton (British, 1917-1957) Colour Separation pen and ink 37 x 26cm (14 9/16 x 10 1/4in). 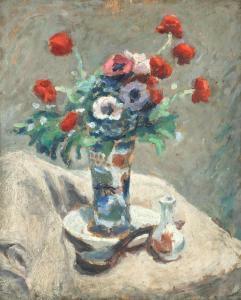 Footnotes Provenance Sale; Christie's, South Kensington, 3 December 2003, lot 785 (part lot) With Sally Hunter Fine Art, London, where acquired by the present owner, 12 September 2007 Private Collection, U.K.